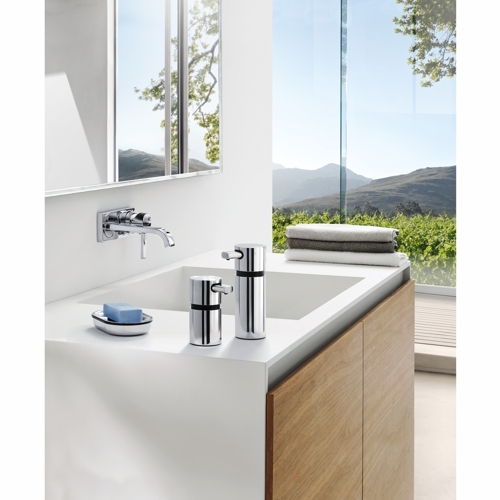 At Contemporary Heaven we stock a wide range of goods manufactured by Umbra, including the Umbra kitchen ware range and Umbra bathroom ware. They produce a number of products in their "Buddy" design – the little man with outstretched arms who is your "buddy". For instance, there is the Buddy Corkscrew. Made of a shiny silver coloured metal, the top part of the Buddy Corkscrew is the corkscrew itself which, when not in use, sits in Buddy's legs keeping it protected, and safe from somebody accidently hurting themselves on the point of the corkscrew. The outstretched arms give you a great grip when using the corkscrew for its' most important purpose – opening that bottle of Chateau Plonque 1987 for dinner. Buddy makes his appearance again, this time in black with his outstretched arms holding a bunch of napkins, keeping them tidy in the kitchen, on the bar or on the table. Always busy, Buddy arrives again at the bottom of a black metal kitchen roll holder, holding that in place and allowing you to tear off a sheet one-handed. The funky little man seems to get everywhere and will make everybody smile when they see what he gets up to next. Not everything is Buddy, though. How about the Umbra Furlo expanding kitchen utensil holder? This is a great idea, at four inches wide and expanding from 8" to 11" long, it will hold wooden spoons, stirrers, long-handled spoons, knife sharpeners, and all those other handy kitchen utensils that you need to grab when cooking. It also has space for three kitchen knives and can just sit on the counter top next to the cooker. Then there is the Umbra XDry Folding Dish Rack and Drying Mat. This is a wire dish rack that lives inside the drying mat when not in use. When needed to dry plates, it opens out into an X shape and holds up to 18 plates. It also has a swing out stemware holder which will hold wine glasses or mugs, while the mat can be used independently to dry pots and pans. Altogether a clever little piece of design. Umbra also make the Sinkin Dish Rack in white, which can either sit on the draining board or in the sink and can be used to dry a lot of plates, mugs, cups, and glasses at once. It also has a holder in one corner for drying cutlery. The Sinkin Dish Rack has rubber-coated feet so it will not scratch your sink.